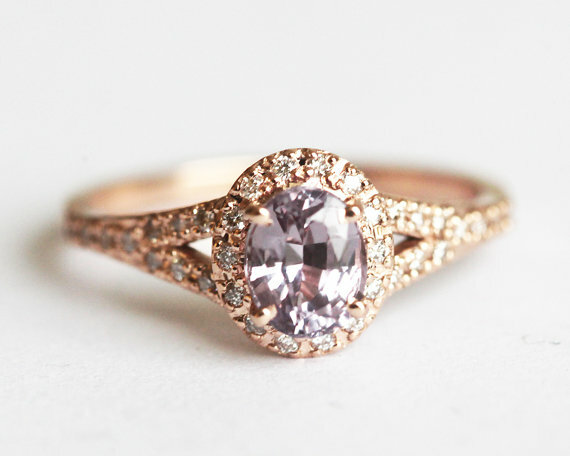 Whilst on the search for the perfect engagement ring, people tend to overlook pink gemstones. White seems to be the more traditional choice, but you aren’t just any ​bride now are you?Pink gemstones aren’t for everyone, we get it. After all, how many times have you actually seen a bride sporting a pink sapphire or morganite engagement ring? Yeah, that’s what we thought. We haven’t seen too many either.​Yet that doesn’t mean you can’t get one. If you love the idea of ‘pink’ as the ultimate reflection of your love for one another, then go for it. Buy what you ​will enjoy love wearing for the next 30, 40, or 50 years. Don’t regret buying a boring white diamond just because some wedding industry marketing machine told you to buy one. 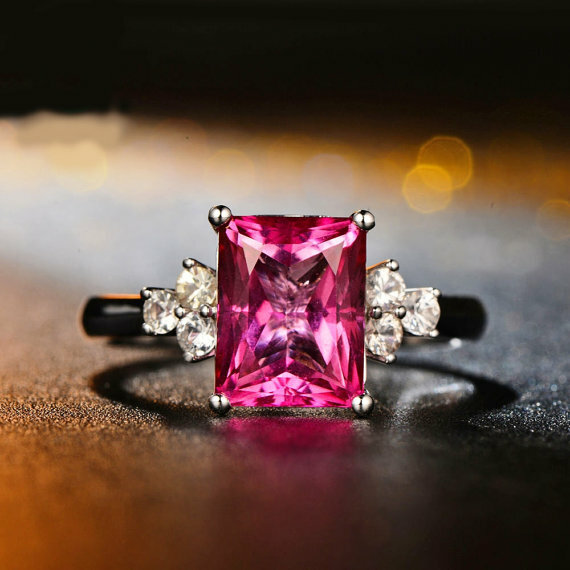 What makes a ring with a pink gemstone all the more special is the meaning of pink. People tend to associate it with femininity. Yes of course, it’s supposed to be a “girly” color, but that’s not ​the primary reason we think it rocks as your big rock. Pink is the color of universal love, and means “I will never forget you!”It’s actually very romantic! Pink is also used to express contentment, so we are sure that sporting a pink ​rock will trigger even happier times in your life beyond your big day. 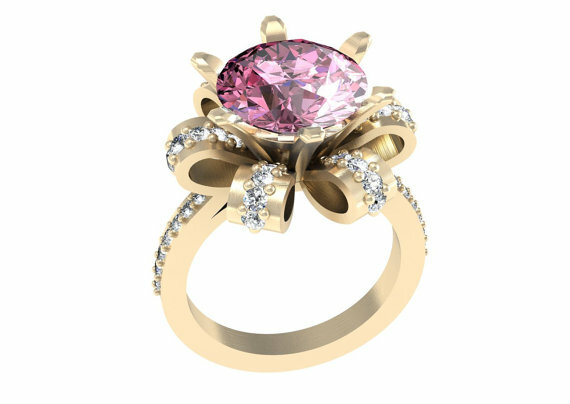 You’ve decided to go with a pink gemstone, and now you just have to think about the type of center stone. There are a lot of gemstones on the market that you can get in pink for your unique ring, but our particular favorites are sapphire, morganite, tourmaline, and topaz. 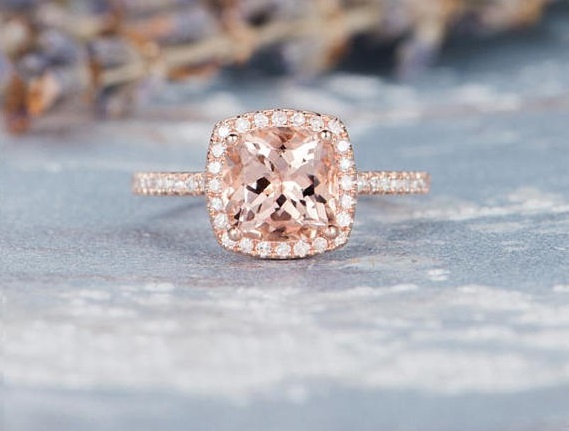 Read on to see our top 12 picks for a pink gemstone ring! This gorgeous engagement ring features a light pink sapphire at its center. It is just the right shade for a subtle, classy look. The silver band works perfectly with the pastel pink tones of the gemstone, and it has a feminine finish. The ideal ring to pop the question? We love it, but we’ll leave that decision to you! This gorgeous engagement ring features a light pink sapphire at its center. It is just the right shade too – not too light, but not bright pink, for a subtle, classy look. The silver band works perfectly with the pastel tones of the gemstone, and it has a feminine finish. 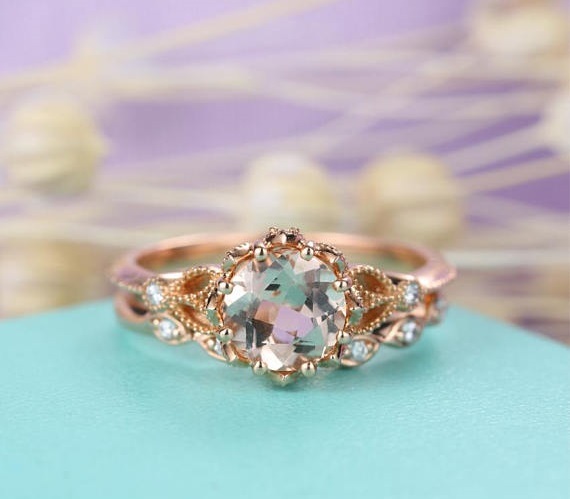 The ideal ring to pop the question? We love it, but we’ll leave that decision to you! If a pink gemstone isn’t romantic enough for you, check out this heart design ring for an even more adorable touch. The band is in white gold, and the pink sapphire is surrounded by diamond embellishments for that extra wow factor. This ring will definitely bring a smile to her face! Why would Morganite make a wonderful choice for an engagement ring? 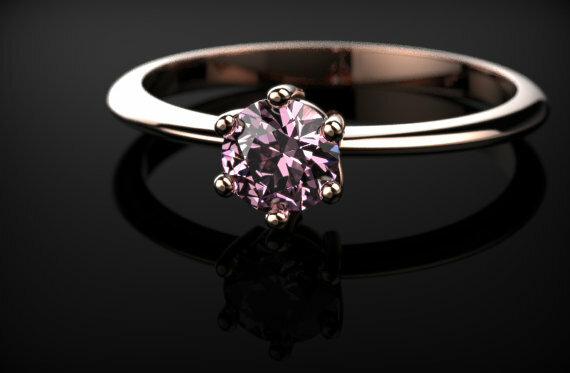 Well, the stone is known to protect your heart, so let her know you will protect hers with a beautiful morganite ring. We did a whole other post on morganite if interested. This exquisite ring has a natural Morganite center stone and is embellished with diamonds. The band is your choice, but doesn’t rose gold perfectly match the Morganite gemstone? You can even engrave the ring with a special date (wedding day or day you met) for an even more romantic touch. This gorgeous piece makes for an excellent engagement ring. 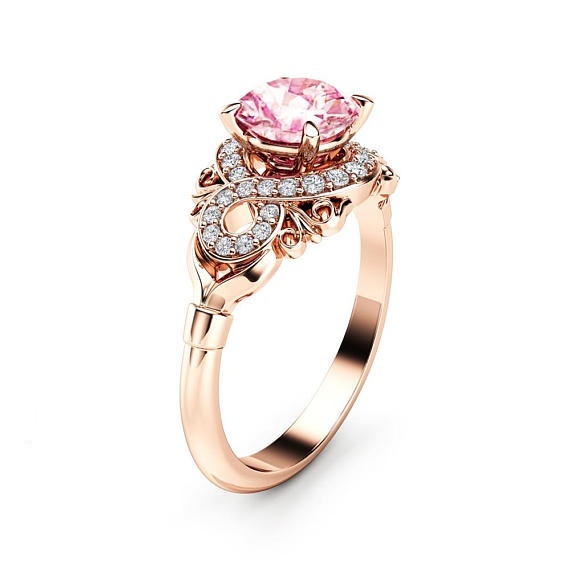 It is handmade in round cut Morganite and diamonds, giving it an all-over pink hue. The accent stones are natural conflict free diamonds. 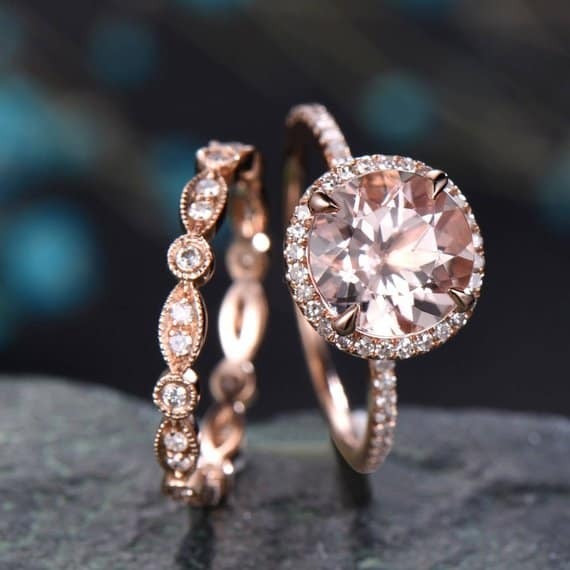 The peach tones in the rose gold and Morganite are hard to resist – especially when you see the price. It is an affordable ring that is still spectacular! It’s true how the simplest of designs are usually the classiest. This design is so simple, with its thin band and diamond halo embellishments, but it is still absolutely beautiful with a minimalist feel. The Morganite is cut into a rounded square for a flattering cut. This ring can also be engraved — what’s not to love? At its center is a California pink tourmaline, which really speaks for itself. The octagonal shape of the tourmaline breathes utter modernity into an otherwise traditional design, and the darker pink shade flatters even the fairest of skin tones. It is a beautifully crafted engagement ring with an unusual gemstone design — one that we instantly admire and appreciate! 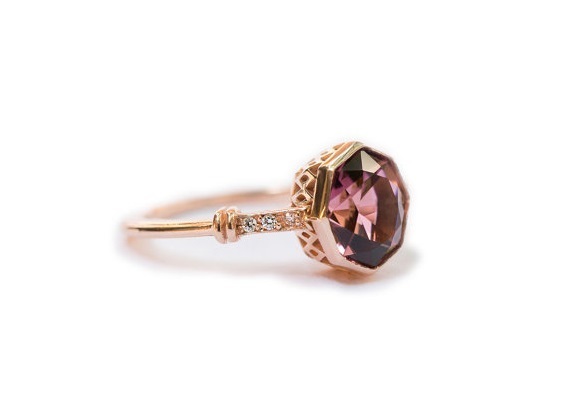 This rose gold ring features a pink tourmaline stone that has been ethically sourced, so you can rest easy. It has an antique-inspired design, with diamonds embellishments surrounding the tourmaline stone. The double-band design makes it even more feminine and chic. The designer can add a matte finish if requested, which is quickly becoming all the rage in the ring world. A beautiful ring for a couple looking for something special and one of a kind. 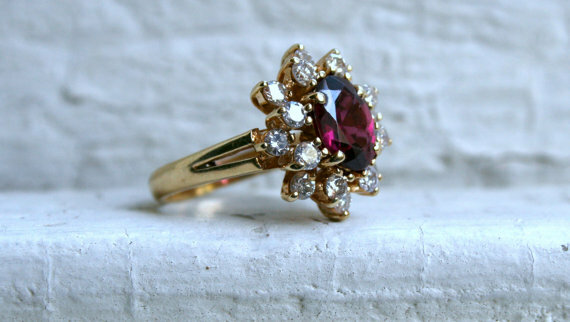 This is a vintage piece is from 1980s.This ring features pink tourmaline surrounded by 16 round cut diamonds in a cluster formation and finished with a beautiful 14k yellow gold band, proving that pink gemstones don’t necessarily have to go hand-in-hand with rose gold. Topaz is a stone that is said to bring true love and fidelity – something you truly want in a ring and a relationship. The design is one-of-a-kind thanks to its rose shaped claws. Roses are a symbol of admiration, and one thing’s for sure: you and your future fiancée will be admiring this gorgeous ring for a long time! The thin rose gold band flatters this ring with just the right aesthetic balance. If you want something a little different for your engagement ring, an emerald cut gemstone is the way to go. The bright shade of this pink topaz goes wonderfully with the grey hue of the diamonds, and the platinum band is just divine! Are you looking for something a little more grand? Well, this ring is a show-stopper! It not only features pink topaz, but also a matte yellow gold band embellished with white diamonds halfway around the band for an extra bit of sparkle! The shine from this ring will make anyone truly speechless, and the multiple hues from the topaz are amazing to view. 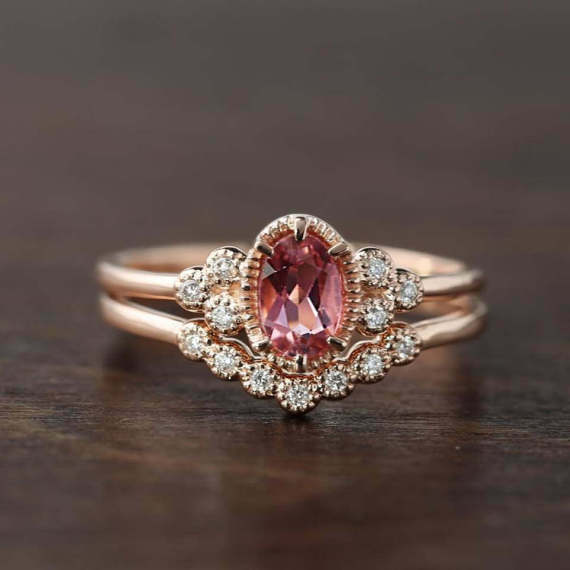 Thanks for reading our roundup of pink gemstone rings, we hope you got at least a little bit of inspiration. 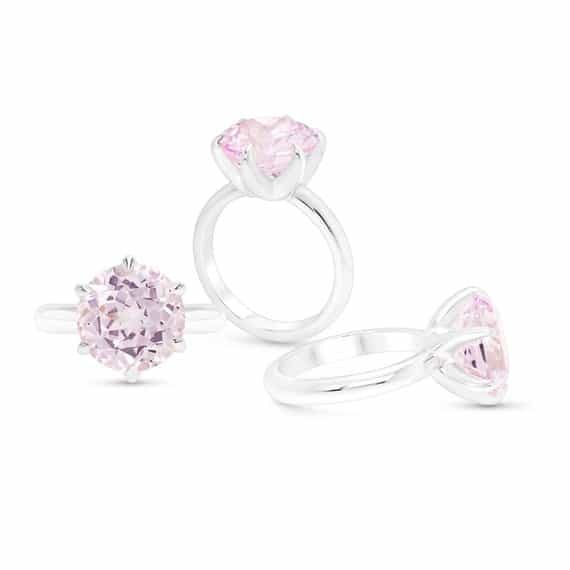 Think pink, and find your dream engagement ring to pop the question!